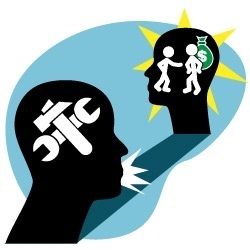 Giving financial help to adult “kids” is becoming a common theme in today’s modern society. 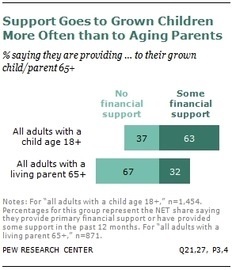 According to the most recent Pew Research Center (PRC) survey, parents in the U.S., Germany and Italy are providing a fair amount of financial help to their adult children. In fact; for the first time on record, the number adult children between the age of 18 and 34 living at home with their parents actually exceed that of other living arrangements. Whether they are asking for it or it’s being volunteered, financial bailout of an adult child who needs or accepts help for recurring expenses may mean they are already facing a financial meltdown. Based on a 2014 PRC survey, six out of 10 parents admit that they gave financial help to their adult children in the last twelve months. 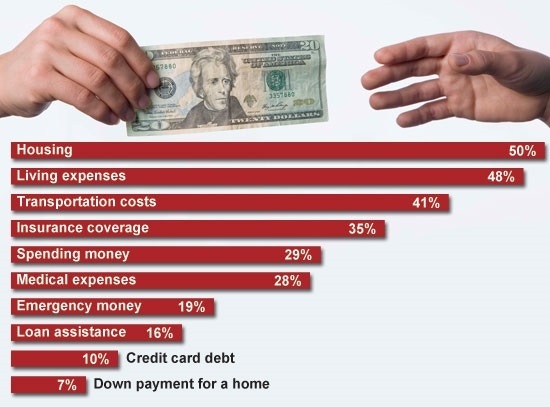 Sadly, when adult children end up in a financial train wreck it can also have an impact on siblings that have been able to skirt financial problems. Michael, a software engineer was concerned that he would eventually be saddled with caring for his adult sister who had been living with his aging parents for more than five years following a breakup with a live-in boyfriend. According to Michael, he always knew that this was not a good situation for his parents or his sister, but didn’t know how to address the situation. Once his parents entered their retirement years, they started reaching out to Michael for financial help to supplement a retirement income intended for two but that is also supporting his adult sister and her young son. Keeping adult children stuck in a dependent mode. Hijacking the parent’s retirement savings and dreams. While it may be okay to occasionally offer financial assistance to an adult child who may have lost a job or experienced a major financial hurdle, financial support that goes too long can have a crippling effect on your loved one. Repeated and consistently handing out money for basic expenses, communicates to your adult child that they are not capable of meeting their financial obligations on their own. Psychologists also expressed the opinion that when a bail-out pattern of behavior becomes established, the parent has assumed the role of an enabler. Helping out tends to become a pattern of unhealthy rescuing. If you try to "save" your adult child every time he or she is in trouble, you may be making things worse in the long run. Unfortunately, children of enablers typically lose their motivation to make money on their own and eventually segue into a chronic state of financial dependence. The following are some signs that you may be already be reinforcing financial dependence in your adult child. Giving to your adult child has become so habituated that they are no longer trying to make it on their own. You continue to help out even though it presents a financial hardship for you. You have already begun to dip into financial savings for your retirement years. You have put yourself in debt in order to support the needs of your adult child. a) The first step is to sit down and talk to your adult child about the giving and receiving situation. Even if it has not become a habit, talking about the potential repercussions of repeatedly helping out could have a positive effect in stopping it from becoming an expected event. In many instances, recipients of financial help have no idea of the sacrifices being made on their behalf. For giving that has become regular, having an open discussion may help them to understand how it could affect them in the future or how it may be impacting your budget and ability to meet other needs. b) Remove unreasonable expectation by being clear about what you can or cannot give and when you will or won’t help. c) Create a plan to gradually reduce your support over a three to six-month period and set a time limit on how long you will continue to provide assistance. Share this information with your adult child. When the cutoff time comes, it is important that you follow through. d) When necessary, suggest that your grown-up child seek career counseling and/or vocational training to help them get on their feet for the time when you will no longer be able to offer financial support. 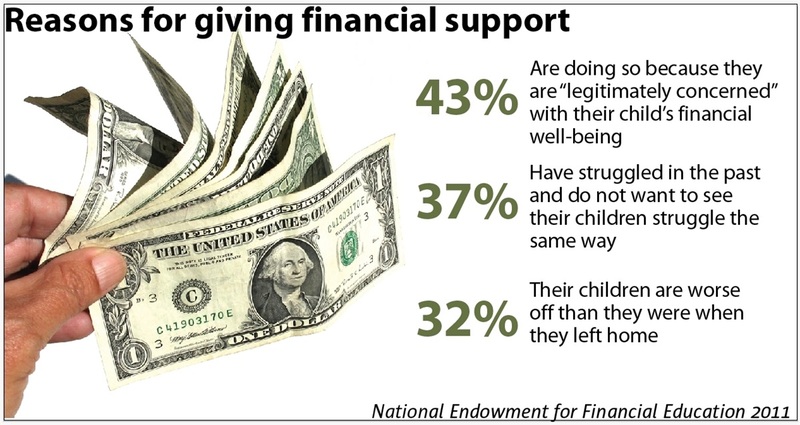 People who experience financial problems that cause them to seek or accept help from their parents often benefit more than they expected to from financial counseling. Even basic fiscal advise about budgeting and debt management can build financial confidence and independence. e) Avoid giving cash help directly. A better idea when offering help is to pay directly to the bill collector such as the rental agency, mortgage company or child care service. f) Parents often feel they have good reasons for giving financial help to their adult children. But it is important to think about whether your giving is helping or has the potential to handicap them in the future. This is even more critical if it turns out that you are not able to help any longer or you are not around to provide financial support that they have grown accustomed to. g) Consider your other children who may equate your constant support of their sibling as emotional inequity. Share your concerns and any plans to wean their sibling off of your financial support with your children. Together you may be able to break the cycle and restore some semblance of family harmony at the same time.